Our Man's adventure quickly becomes a nightmare as his radio equipment fails and his now-leaky yacht, the Virginia Jean, drifts into the path of a violent storm. Tempest-tossed, the nameless sailor does what he can to fight cruel nature, subsisting on his waterlogged rations of canned beans, using a sextant and a nautical map to try to navigate into a shipping lane and hail a passing cargo ship. Along the way, he also contends with a shiver of sharks, a gash on the forehead, and the sinking of his beloved boat. Things begin to look pretty hopeless for Our Man, and when he emits a loud, one-word curse, it's more than justified. If the movie were true to its narrative and its title, Our Man would assuredly die. Without language and human interaction, much relies on the production values, which are quite good. 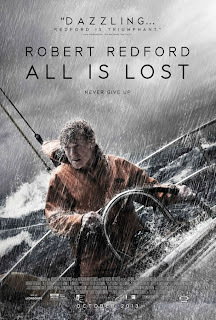 Frank G. DeMarco and Peter Zuccarini's cinematography is impeccable, highlighting the terrible beauty of the stormy sea and ominous skies. They do a considerable amount of underwater photography, offering unexpected perspectives, like Our Man's lifeboat as seen by passing schools of fish. Alex Ebert's score, with its plaintive five-note theme, is haunting. Chandor, who previously wrote and directed the sub-Mamet Wall Street drama Margin Call, has a tendency to eschew character in favor of action, cinematography and star casting. His attempt to make a dialogue-free Everyman tale of Man against Nature is essentially a stunt. (How much of an “everyman,” by the way, is a wealthy WASP with a 39-foot yacht?) The idea might have been effective as a thirty-minute short, but it's a lot to ask of an audience to concern itself with the fate of a non-character for nearly two hours. And yet, come Academy Awards season, nominations and hosannas will undoubtedly abound. 2 3/4 out of 4 stars.